A view of Kahramana square in Baghdad. Rising car sales and interest in Iraq by major automakers are signs of optimism amid continuing violence and political strains. BAGHDAD -- Backed by the world's fifth-largest oil reserves and a population bigger than Saudi Arabia's, Iraq is attracting the attention of global automakers including General Motors Co., Ford Motor Co. and Volkswagen Group. Western cars were shut out of the Iraqi market by sanctions during the Saddam Hussein era. The lack of modern vehicles is evident in the survival of many VW Passats that were shipped to Iraq from Brazil between 1983 and 1990 in exchange for oil. Now rising incomes and declining violence are fueling demand for a middle-class lifestyle that includes autos after years of conflict following the U.S.-led invasion that ousted Hussein's regime. One of the popular models is Chrysler Group's Dodge Charger, nicknamed "Obama" after the U.S. president by Iraqis. Cars have always been powerful emblems of a society. A small rush of international automakers into Iraq and rising sales are signs of optimism amid continuing violence and political strains. The country's economy, boosted by oil revenues and foreign investment, will probably grow faster than 10 percent this year, outpacing all other countries in the Middle East and North Africa, said Philippe Dauba-Pantanacce, a Dubai-based economist at Standard Chartered Bank. Higher incomes are generally accompanied by greater spending on durable goods such as automobiles, he said. The growth is underpinned by safer streets. Around 1,500 Iraqi civilians were killed by bombs, sniper ambushes and other attacks last year, according to the Brookings Institute's Iraq index. While that's a high loss of life, it's the lowest figure since the fall of Saddam Hussein in 2003, when deaths totaled 7,300. Civilian fatalities peaked at 34,500 in 2006. 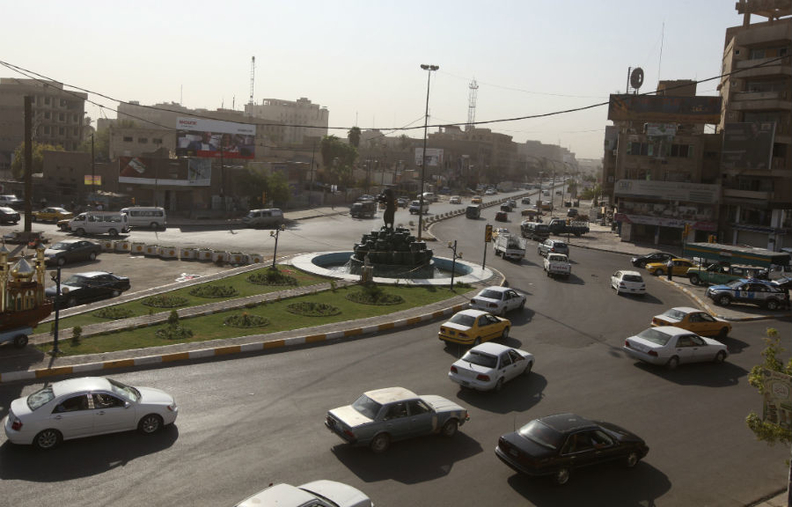 The economic benefits of Iraq's revival are palpable for people like Sarmad Khalid. Buoyed by the access to new vehicles and a minimum wage that's risen to around $400 a month from the equivalent of $2.60 in Hussein's era, the 54-year-old got a chance at a new start. The former government worker bought a Samand, a sedan manufactured by Iran Khodro Co. that's popular among Iraqis. He now works as a taxi driver after scraping together an existence with work at a relative's grocery store and as a teller in a currency exchange since 2003. "I can now make a living and feed my family of three kids and a wife, after losing my job following the invasion," said Khalid. With a population of more than 30 million people and a growing economy, Iraq's auto market has "huge potential," said Stefan Mecha, VW's managing director for the Middle East, projecting industrywide sales to rise by a third this year to 120,000 vehicles. Demand could get much bigger. In neighboring Saudi Arabia, which has a population slightly smaller than Iraq's, there are about 6.5 million registered cars, according to IHS Automotive. That's about five times the 1.35 million vehicles in Iraq, according to Hamid Algharbawi, owner of a high-end car dealership in Baghdad. Official data aren't available. Iraq holds "a lot of promise," said Larry Prein, Ford's managing director for the Middle East. Ford expects sales to double this year after tripling to 2,000 in 2011. Niva Car Ltd., Ford's dealer in Iraq, plans to invest $200 million over the next three years to open new outlets to tap the rising demand, said Mohammad Fuad Alanaswah, the dealer's chief. "It's a tough market to be in, but it is growing," said Alanaswah. "We believe in our market. That's why we are expanding." GM plans to invest in new showrooms and service centers in Iraq after initially entering the market in 2003 by selling to the government, U.S. forces and aid organizations, said John Stadwick, head of GM's Middle East operations. Last year, GM's sales surged 68 percent to 32,000 cars, making Iraq its second- largest market in the region after Saudi Arabia. Still, poverty and security remain hurdles to further expansion. Iraq's economy will probably grow to the equivalent of $3,528 per person this year, according to the International Monetary Fund. That compares with $20,214 in Saudi Arabia. Joblessness is also probably close to 40 percent, according to the World Bank, more than three times the official unemployment rate of 11 percent.